Let anyone aggregate and visualize data with the simplicity of spread­sheet tools, but produce repro­ducible source code making the analysis fully transparent and open. Create embedded tables and charts that are linked to the original source and encourage the reader to explore data further and find more fun facts on their own! Built at The Alan Turing Institute, available as open-source using the permissive MIT license and supported through the Google Digital News Initiative. The Gamma makes it extremely easy to summarize data and create useful tables and nice visualizations. Thanks to the built-in pivot type provider, the language understands your data source and exposes all operations in an easy to discover way. Just type dot and see what columns and operations on them are available! This example calculates the top 8 medalists from Rio 2016 Olympic games, sorted by the total number of gold medals. 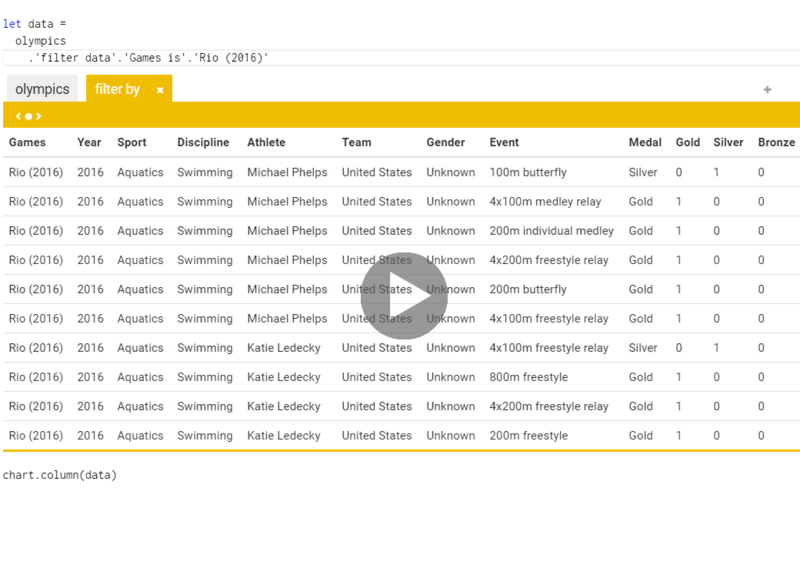 You can understand the code even without programming experience - we filter all Olympic medals to cover only Rio, then we sum gold medals per athlete, take the top 8 and return a data series that maps athlete name to number of gold medals they won. With The Gamma, you can edit the code by hand with modern tooling that offers available members when you type dot, but you can also use live editor that shows the results instantly and lets you modify the code from a simple user interface. Try it below! If you want to see The Gamma in action, check out the visualizations of Olympic medalists, which was created using early version of the project. See also blog post documenting some of its features. Click below to view and edit the code in our innovative editor with live previews! Can you change it to see medals for London 2012? Almost anyone can use a spreadsheet to perform basic data analysis and create a chart, but doing the same in a transparent and more flexible way using a programming language has always been a task for experts. What would an environment somewhere between spreadsheet tools and programming language look like? When exploring data in The Gamma, you can always see the data you're working with just like when manipulating data using a spreadsheet. You can write the code to transform data using a modern, powerful editor with autocomplete that understands the data source and suggests what operations and columns are available. You do not always need to write code. For many common operations such as grouping, sorting and filtering data, the live preview lets you add and configure data transformations in a simple user interface. However, the code is always visible and so anyone can understand your data analysis and reproduce it. Once you create context, you can use the evaluate function to run any script written using The Gamma (this does not even require the editor). This is used on this page to create the chart of top Olympic medalists from Rio 2016 that you can see above. The createEditor function is then used when you click on the "Edit source code" button. As you can see, thanks to The Gamma, creating an open and transparent environment that encourages readers to explore data on their own is just a matter of writing a couple of simple lines of code! Exploring data: Learn more about The Gamma script and the code you can write to transform data in our editor. This is a non-programmer guide to using The Gamma. Publishing data: Create a service that exposes data for the pivot type provider. The service needs to provide a single end-point that can return the data and evaluate simple aggregations. This project would not be possible without the funding provided by the Google Digital News Initiative and the support of the Alan Turing Institute. Thank you! All source code is licensed under MIT License and is available on GitHub. If you have any interesting project ideas or would like to collaborate, please contact Tomas Petricek at @tomaspetricek or [email protected]!